Once you get past the trainer kite stage, you will look at getting your own kiteboard. ithout the boards, there is no kiteboarding of course. That said, there are some unique boards that have been engineered with kiting in mind and don't necessarily cross over well with other sports. As an example, the wakeboarding boards are not that great for kiting and kiteboarding boards are not very good for wakeboarding. All of the boards that we offer for sale here are used specifically for kiting and in the case of the mountain boards, these cross over without any problems. There are probably 3 main types of kitesurfing boards. The first would be the free-ride board that allows for riding in almost any condition. 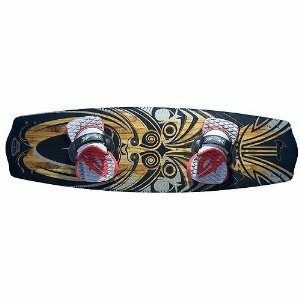 The second type is the wake-style board that is a short board with wakeboard bindings (or relatively close to the same thing). The third main type of board is a surf-style board that looks a lot like a surfboard and is designed more for wave riding. In the free-ride category, we offer the HQ Mana kiteboard. This is a sweet ride that has good flex and is shaped to handle both excellent pop after an edge as well as a stable ride in heavier chop. Although kiteboarding isn't always about showing off, the design is unmistakeable and will turn heads. This board will grow with you and keep you getting big air if that's what you're after. The other free-ride board we offer is the Progressive Sports Flying Phish. This not only is an excellent board for beginners to intermediates for its ability to plane easily, but is also a fantastic light wind machine! It has several features with the board itself, but the real benefit to this board ownership is that you'll be able to use it season after season. These boards are typically smaller and shorter than free-ride boards and will have a binding system similar to a wakeboard. Unlike the free-ride where there is simply a foot pad with a strap, these have a "boot" style binding that encloses the foot. The main reason for this is to allow the rider to get more wake-style tricks where there is less chance of the board flying off with a fast spin. The wake-style boards are great for any new riders coming from a wakeboarding background. One other subtle difference between a wake-style kiteboard and a wakeboard is the channeling on the bottom of the board. Due to the fact that the kiteboard rides almost sideways or at least edges, there is no need for the channeling which will give too much skate along the water when kiting. Kitesurfing gets its name from those riders who transitioned from surfing by paddling into a wave to being "towed" into waves using the kite. In any case, those that are surfing the waves will appreciate having a board that matches very closely what they previously rode when surfing. In fact, many riders with experience surfing do use their surfboards when kitesurfing. The kiteboards that are for surfing are typically called "directional" boards which means that the foot straps are placed in such a way that the board could be ridden with either foot first depending on which way the kite is going. The switching between feet at the end of each turn is called a jibe which is what is done when windsurfing as well. For those adventurous riders that have no bindings or footstraps on their boards, any accidental catching of air or jumping will have them landing in the water instead of on their boards. There are some riders that can hold their board with the right pressure and direction and land a jump, but we're talking some riding done at some very high levels. Most kitesurfing boards stick with the foot straps to keep the board attached. You may see board leashes for sale and we also suggest students avoid these. While they are used for surfing and seem like a practical idea, too many injuries have resulted. The reason is because the board can get taken underwater and then spring of the leash pulls the board back into the kiteboarder. If you decide not to go with a leash and you lose your board, you'll end up with the need to perform an upwind body drag which involves making your body as stiff as possible with an arm extended to steer you upwind as the other arm puts the kite at the sides of the wind-window in order to keep you going back toward your board. Unless there is a major current in the other direction, the board will come towards you with the wind or stay put. It is not uncommon for a rider to have multiple boards. This is especially true depending on the locations near where you ride the most. Taking good care of your board will make sure you have it for a long time to come. Get information on where some of the obstacles are for your local riding area from riders that know. Some areas are going to be easier to get to than others and some areas will have easier launches. If your board gets some scratches, it will most likely still be rideable. Give your board a nice rinse after each session and keep it stored away from dust and dirt as much as possible. Board bags can help keep your boards in good condition as well. Getting the right kiteboard is also a matter of trial and error over time. Getting started as a new kiteboarder means having a board that will get you riding as soon as possible. Beyond that as your talents and skills improve, expanding into other types of riding will have you riding with board just right for the conditions. Connect with any of our staff at our pro shop for what kind of kiteboard we have that will not only fit your budget, but also take your riding to the next level.